Savory Chicken and Savoy Cabbage Skillet, Thyme for Cooking easy main course. Sauté it all briefly, put the lid on and let it cook: easy skillet dinner. Remove outer, dark green leaves from cabbage. Cut a slice off the cabbage, cut the slice into thirds, then slice thinly. Heat oil in large skillet over medium-high heat. Add onions, ginger, garlic, chicken and stir-fry 5 minutes. 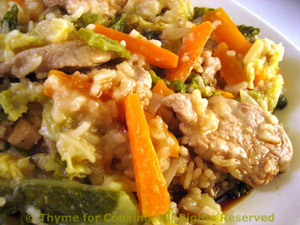 Add rice, carrot, cabbage and stir-fry 5 minutes longer. Add stock, soy sauce, reduce heat, cover and simmer for 20 - 25 minutes, (until rice is done) stirring occasionally to prevent sticking.